Children from Richardson Dees Primary School get this year's campaign underway with a litter pick. They were joined by the council's environmental mascot Waldo the Wonderdog and area officer Wayne Young. An annual campaign to keep North Tyneside spick and span has returned. Back for the ninth consecutive year, North Tyneside Council’s Autumn Campaign runs from now until November 25 and aims to make the area an even cleaner and safer place to live, work and visit. Extra sweeping vehicles have been introduced to reduce the amount fallen leaves and litter found on the borough’s streets. And schools, community groups, businesses and residents are being encouraged to organise clean-up events to support the initiative. The council will also continue with its enforcement work, taking a strict approach to anyone caught littering or not picking up after their dog. 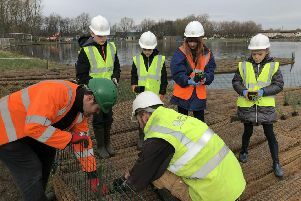 Coun John Stirling, cabinet member for environment, said: “We work extremely hard to maintain the high environmental standards found across North Tyneside and campaigns like this one help us to do so. Last year, the Autumn Campaign saw 65 tonnes of leaves and litter removed from the borough’s streets, which was recycled wherever possible, and this wouldn’t have been possible without the brilliant support we received from the public. I’d really encourage anyone who can lend a hand this year to get in touch with our teams. To arrange a clean-up event in your area, call 0345 2000 103 or email Envirolink@northtyneside.gov.uk. The council will provide litter picks and take away any rubbish collected.